Why, might you ask, would I revise a perfectly good Christmas Cranberry Biscotti recipe? Well, rest assured, my gluten free readers, it’s not because this recipe is any better than that recipe. It’s partly because I had some spelt flour I wanted to use, and mostly because I couldn’t find any almond or cocunut or other non-dairy yogurt within walking distance of my house that didn’t have carageenan in it. I didn’t used to worry about this, but over the past year I started sleuthing why my gut would tighten up for no particularly good reason on a diet full of fiber, and the additive carrageenan eventually showed up as the culprit. I could trace my intermittent troubles with it all the way back to about 4 years ago when for convenience sake I started buying my almond milk instead of making it myself. And then I noticed it was in all the toothpastes that gave me, for lack of a better term, “stomach aches” if i used them. So I decided to try and cut it out completely. And the difference for me, was like night and day. I had to laugh. The giant electron in the sky that seeks to second guess all our consumer wishes had read my mind and was reaching out to me from behind the glass door of the refrigerated case. It was kind of like so long ago when Mike was just six and we volunteered at the Moscow Food Co-op for a discount and he wanted to spend the entire morning in the refrigerator case personally handing out milk to people who opened the doors. There was one hitch. Non dairy creamer is not as thick as non-dairy yogurt. But this was on sale to boot, so I decided to take it home and do some chemistry experiments. The results, I’m delighted to say, were absolutely delicious, confirmed not just by me, but an non-vegan neighbor, and my son, who is quite devoted to the original recipe. I was especially pleased that the anise seeds I had collected when I helped put Bakari Garden to rest in November give these cookies the anise flavor that my Dad used to love in the Stella Doro classic Anise Toast. But of course if you don’t have anise seeds to grind, use anise extract. or extra almond extract. Any way you flavor it, these are a wonderful holiday treat. And you can make them gluten free by following the original recipe and subbing the wet ingredients here. You might need a tad more flour to get the dough to hold together, but you’ll be able to tell. Put the whole almonds in your food processor with the s blade and process until they are a coarse meal. Add the flours and the baking powder, salt and anise seeds and, (even though it’s a technically wet ingredient) also add the small pieces of orange, including the peel. Process until well combined. Now add the wet ingredients. Process until a dough forms that starts to pull away from the sides of the bowl (doesn’t take very long). The dough will be sticky. Remove it into a medium sized mixing bowl and add the chopped nuts and the craisins or currants. Mix to combine with a fork. On a large cookie sheet lined with parchment, shape the dough into two long narrow loafs as shown in my original completely gluten-free biscotti post and follow the directions with photos there for scoring the loaves and baking. It helps to handle and shape the dough if you slightly wet your hands or fingertips with a little cold water. But not too much. Notes: This is messy dough. It’s an inexact, peasant-style family recipe I’ve altered to accommodate my food needs. So don’t be discouraged if it sticks to your fingers and you feel like the loaves are puny and the biscotti will be puny too (that happens with the traditional recipe too). They won’t. They will rise and expand beautifully during those first 15 minutes of baking. They are sweet while being relatively low in sugar, but there is sugar in the creamer and then of course there’s the maple syrup. And while lower in fat than traditional biscotti, these are not fat free, but they are oil and butter and vegan butter free. That’s a pretty healthy way to splurge in my book. All silliness aside, and whether you make biscotti or not, may your Christmas be filled with true wonder and heart-opening delight. Looks delicious, Maria. Merry Christmas and have a spectacular New Year! Thanks Jacqui! Merry Christmas and a spectacular New Year right back to you! What a beautiful wish you created for us. Thankyou so very much. Grateful to have you in my life from the other side of the world but just a heartbeat away. Hi Maria, your biscotti look delicious! I’m going to try to work them into my holiday baking somewhere, although things are crazy enough right now that they may have to wait until the new year. (But there’s not much I love more than crisp biscotti dunked in a steaming cup of coffee!) Do you think I could replace the spelt flour with oat flour to keep them gluten free? 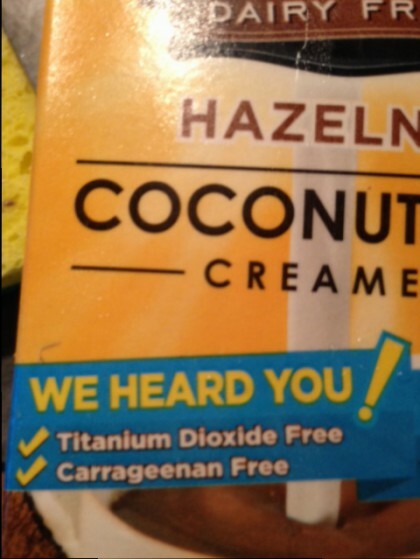 Also, I wasn’t familiar with the potential gastrointestinal effects of carrageenan. I’m definitely going to look into it–thanks for the heads up! Hi Leigh–you could try that–but you could also use my original and completely gluten free recipe from 2013 which I link to in this most recent version. 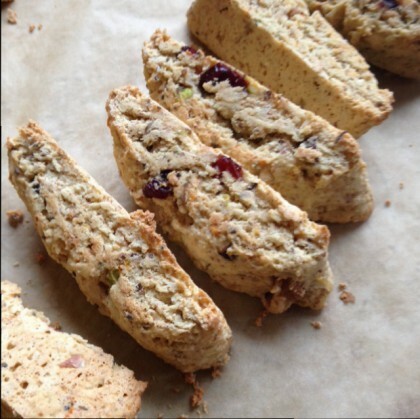 Here’s the link again: https://fatfreevegan.com/slowmiracle/2013/12/11/christmas-cranberry-pistachio-biscotti-vegan-and-gluten-free/ Also, glad you found the heads up about carrageenan worth looking into. Happy Holidays! I used to make biscottti a lot, and I appreciate a biscotti recipe without oil (or butter), as it should be for proper sturdiness. I buy that brand of creamer now and then (on sale), so it will not be out of the norm to get some for this recipe. The flavorings for this sound terrific; the "whole" clementine (or whatever) is inspired, and you can bet I'll be adding the Grand Marnier in with it! What could I sub for the creamer? Delicious sounding recipe! HI JCB, thanks for your question. As I mentioned in the post, you can also use my original biscotti recipe, which I provided a hyperlink to. That uses non-dairy yogurt instead of the creamer and the proportions are slightly different. You can sub out the gluten-free flour combination in that recipe for wheat flour if you like. 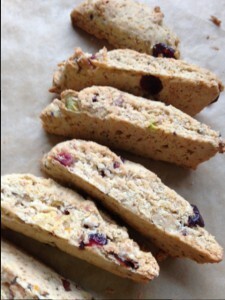 Here’s the link again: https://fatfreevegan.com/slowmiracle/2013/12/11/christmas-cranberry-pistachio-biscotti-vegan-and-gluten-free/ Hope you enjoy trying out making biscotti!